Lightning Motorcycle revealed the LS-218 electric Superbike at the Quail Motorsport Gathering held in Carmel, California. Lightening claim it is the most technologically advanced and highest performing street-legal production motorcycle in the world – the Lightning Superbike LS-218! The Lightning LS-218 presents the first opportunity that consumers can purchase a production motorcycle capable of setting land speed records and winning road racing competitions that is as easy to ride as a 250 cc commuter bike. Lightning’s LS-218 IPM liquid cooled 10,500 rpm electric motor can produce in excess of 200 hp and 168 ft/lbs of torque. Lightning’s proprietary Ultra High Power Density Drive system allows max power setting without any concerns of overheating. At highway speed, LS-218 can exceed 100 miles range per charge with the standard battery package. You can use the standard power outlets to charge LS-218. At public fast charging stations, it will take less than 30 min to charge. The Lightning LS-218 is a direct street legal version of the same bike that won AMA and FIM races and set land speed records. Customers can purchase a Lightning LS- 218 and have the same opportunity to win an FIM EPower race or set a land speed record themselves while still using their LS-218 as daily commuter bike. “Consumers no longer are required to pay more for less performance to support green technology,” said Richard Hatfield. “The Lightning LS-218’s can compete with the best ICE alternatives today. Lightning achieved the goal we set in 2009 to compete against and win against the best gasoline race bikes. 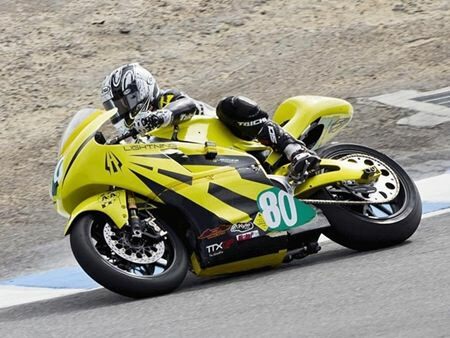 In June 2013 at Pikes Peak Lighting won first overall competing against 93 other motorcycle teams (electric and gasoline) by over 20 seconds. In addition to the performance, Lightning provides customers unprecedented options to personalize their Lightning LS-218. Some examples of available options are fully programmable Android display, carbon fiber swingarm and frame, titanium fasteners, custom graphic wrap and seating. The Lightning LS-218 has more horsepower, more torque, more speed and more performance than any other production motorcycle on the market. And why is it called the LS-218? Because it was officially clocked at 218 MPH (350 KM/H). I think I would need a double dose of brave pills at that sort of speed! Previous articleJensen returns from the dead (again)! Two wheels, 500 cc and no brakes!